This Christmas family tradition, shared by the Butler family, will not only warm you to your toes but it's yummi-licious too! Perfect for romantic, cozy, or nostalgic evenings around the fireplace or the dinner table, served alone or with your favorite dessert treat. Perhaps a square of pumpkin fudge? Gradually stir water into cocoa. Stir in eggnog and milk. Heat to serving temperature, stirring often. Whip until foamy and serve. 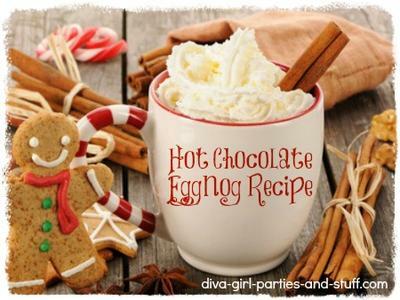 This easy yuletide recipe make 6 1/2 cups. Curl up with friends or a significant other and enjoy a cup over the holiday season. Watch a movie together, listen to carols, chat ... sip slowly ... make it last. Creating Christmas memories is PRICELESS! Great to serve for those Christmas and New Year Parties or just with snack food while watching a movie or those bowl games with the family.